See all the tennis action - from serve to volley to line disputes - for free at Lyric Square in Hammersmith. Screenings take place from 12noon daily from Monday 2nd to Sunday 15th July, the whole two weeks the Wimbledon Championship is on. Pull up a deckchair and watch some world class tennis live on the big screen in W6 and, in nearby Kings Mall, look out for the Wimbledon Winners event where you can test the speed of your serve. 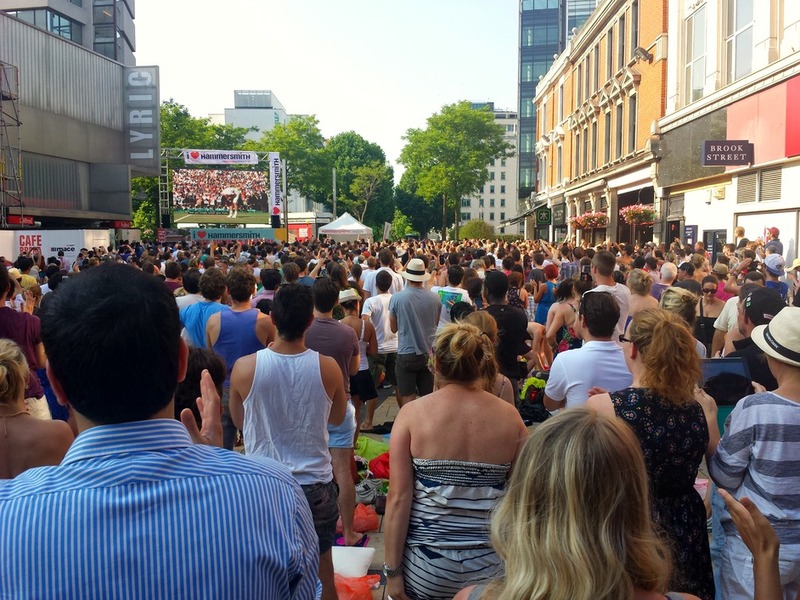 What are the best dining options near Wimbledon Screenings at Lyric Square Hammersmith London? Wimbledon Screenings at Lyric Square Hammersmith gyms, sporting activities, health & beauty and fitness. The best pubs near London Wimbledon Screenings at Lyric Square Hammersmith. Wimbledon Screenings at Lyric Square Hammersmith clubs, bars, cabaret nights, casinos and interesting nightlife. Where to have your meeting, conference, exhibition, private dining or training course near Wimbledon Screenings at Lyric Square Hammersmith. From cheap budget accommodation to luxury 5 star hotels see our discounts for Lyric Square hotels, including Holiday Inn Express London Hammersmith from 80% off.